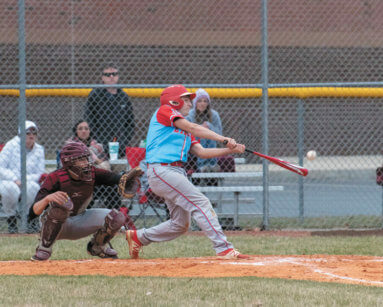 Eagles baseball team wins 5-4 in extra innings – Ripley Publishing Company, Inc.
Eagles senior Logan Drockelman makes contact with a pitch in the photo above. It was Drockelman’s blooper to center field in the bottom of the eighth inning that gave his teammate, Morgan Sutton, a chance to score the go ahead run from third base. The Jac-Cen-Del Eagles baseball team, under the tutelage of Head Coach David Bradshaw, came back from a 2-0 deficit in the early innings of their first regular season game to ultimately win in eight innings by a score of 5-4 over the visiting South Central (Elizabeth) Rebels on Thursday, March 28 in Osgood. The Rebels opened the game by batting in one runner in the first inning and one in the third inning to take a two run lead. The Eagles got their bats warmed up in the bottom of the third with hits by Morgan Sutton, Damon Hughes, and Dylan Swinney. Swinney’s double to center field allowed Sutton to score a run. The Rebels scored their third run in the top of the fifth. Jac-Cen-Del then responded in the bottom of the inning with hits by Sutton, Hughes, and Logan Drockelman. Drockelman’s drive over the head of the South Central right fielder drove in two runs, tying the game at three runs apiece. Both teams added a run apiece in the sixth inning. JCD’s was created after Sutton was walked. Then, he stole second. Damon Hughes hit a single into center field which allowed his teammate to run in for his third time across home plate in the game. A scoreless seventh inning meant the game went to extra innings. The eighth inning saw South Central loading the bases before JCD relief pitcher Nate Scoggins struck out the final two batters to leave all three runners stranded. In the bottom of the inning, Morgan Sutton began with a single up the middle. Damon Hughes then grounded out, although Sutton advanced to third on the play. The Rebels then intentionally walked the next two batters, hoping to create a force-out situation to stay alive. Logan Drockelman had plans of his own, though, and hit a shallow pop up to left field, which was dropped by the Rebels fielder. Sutton tagged up from third base and scored the winning run. As a team, JCD had 11 hits and two errors, compared to South Central’s eight hits and two errors. Hitting for the Eagles: Morgan Sutton (4), Damon Hughes (3), Dylan Swinney (2), Logan Drockelman (1), and TJ Menchhofer (1). Drockelman was credited with three RBI’s, and Damon Hughes one. Sutton stole four bases, and Drockelman one. On defense, Logan Drockelman was credited with nine strikeouts during five innings pitched, while giving up one earned run and one walk. Nate Scoggins was credited with the win, pitching three innings, striking out five, walking two, and giving up one earned run. Next, the Eagles face the South Decatur Cougars in another home match, scheduled for 5:00 p.m. on Monday, April 1.